Pay dispute with Robert de Castella: Alice runner John Bell raises new issues. A bitter dispute has erupted between Alice sporting identity John Bell and former world marathon record holder Robert de Castella over a project that took four young Territory Aborigines to New York, to compete in the annual marathon there. Two of the young runners, Charlie Maher and Caleb Hart, are from Alice Springs. The project was featured in an ABC TV documentary and is receiving $1.2m from the Federal Government to make it an ongoing initiative, according to Mr Bell. Member for Lingiari Warren Snowdon had helped to arrange the grant. Mr Bell says Mr de Castella owes him $100,000 in wages for 20 months’ work but Mr de Castella says Mr Bell was a volunteer and had declined to accept money so as not to affect a disability pension. Mr de Castella claims his arrangement with Mr Bell ended with the 2010 New York marathon and the government funding became available afterwards. When subsequently applications were invited for a co-ordinator’s position, Mr Bell’s “two line application” had not stacked up against others, says Mr de Castella. Mr Bell, who still holds the NT marathon record, says he spent two years setting up the project, using his extensive contacts and experience gained during decades of government and sports coaching work in the Territory, beginning in 1968. All the while he had a “handshake agreement” with Mr de Castella to be paid at the rate of $60,000 a year, from public funds that were being sought for the project, and that he would get the permanent job once it was funded. It does not make sense to forsake $60,000 a year to maintain an ongoing benefit (from a disability pension) of $18,000, says Mr Bell. He describes Mr de Castella as a former friend, but says he should have obtained the assurances in writing. The agency Celebrity Speakers, which represents Mr de Castella, describes him as “Australia’s greatest ever marathon runner” who in 2005 “launched a new gourmet bakery and café [and] has two bakeries and a rapidly growing wholesale business”. Mr de Castella declines to give details about the dispute but says Mr Bell had been “destructive” and “brought discredit on the project. The project and the documentary received extensive media coverage. Mr Bell’s complaint will be heard by the ACT Appeals Tribunal next Monday. Picture at top by Dan Himbrechts, Adelaide Now. Robert De Castella with (left to right) Charlie Maher, Juan Darwin and Caleb Hart. 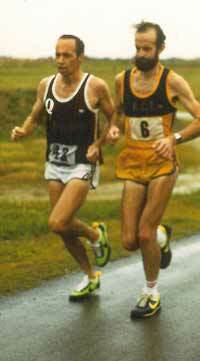 Above right: John Bell (# 42) running for Queensland at National Marathon Titles 1980. As member of a three man team he won the silver medal, beating Victoria. NOTE NEW COMMENT BELOW BY MR BELL. Well said Paul Lelliot. I agree completely! 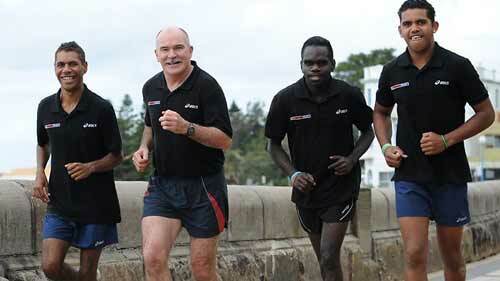 Can we ask Australia’s greatest ever marathon man to table the financials for this project. If this project was to encourage aboriginal participation in sport, a most worthy cause which I have personally championed through football, it would have even more credibility if it were truly “inclusive”. Once again the Macquarie Street Bankers and the Federal Government are ticking all the wrong boxes for all the wrong reasons. We are busting our guts here in Central Australia to promote inclusion in events which have the positive and measurable outcomes of respect and harmony. But then again I’m a dreamer. Two points to note in Rob de Castella’s comments in the Alice News. The first is that his claim that I was a “volunteer” is incorrect. In late March 2009 I received a phone call from Deek offering me a job as Project Coach. He actively recruited me. Before that phone call I had no knowledge of the Project. He asked me to set up his Project in Central Australia for a documentary that was proposed to him by film maker Matt Long of Good Oil Films. The Project was Matt Long’s idea. But neither of the two white men had had anything to do with the Aboriginal community, and they were in desperate need of someone with the skills and experience to set it up for them. Secondly, Deek is incorrect in claiming that “government funds became available afterwards” i.e. after I was sacked on 10 November 2010. In the article he detailed what he wanted the $500,000 for; it included “salary to pay a full time Project Coach to train the athletes to run fast and far.” That was my job. It was the main reason why I was employed. Information I have obtained under FOI from DoHA shows that Deek received $187,000 from DoHA on 28 April 2010 and a further $313,000 for the project on 18 October 2010. A total of $500,000. I worked for the period 1 April 2009 to 10 November 2010. So he got the $500,000 before my employment finished. I discovered the existence of the $500,000 DoHA grant after I was sacked, a few days after my return from New York on 9 November 2010. He cc’d the email to a dozen people in the Project in the NT and at Good Oil Films. Including NT Police. I am presenting this email evidence at the Tribunal and I will point out his public claim in the Alice News on 18 June 2012 that the money did not become available until after my employment was terminated. Deek knew I had no money, being on a Comcare fortnightly disability payment, and he knew I could not afford the airfare and accommodation. I am waiting on an FOI request now with DoHA to obtain details of the Project budget for 2009,2010 and 2011. DoHA has been stalling me for many months. I will know tomorrow. Deek has stated in evidence to the Tribunal that no money was earmarked in the budget for a salary for me. It will be interesting to see if he did or not. If he didn’t I will ask how did he justify the Project to DoHA because grant guidelines state that applicants must have Aboriginal community agreement through consultation. I performed that role. If he did provide a salary, then the obvious question to be asked is – what did he do with it? I also have information from a reliable source that DoHA originally rejected his application but it was overridden by direct intervention by Mark Arbib, who went to New York with Deek in 2011 and ran the NY Marathon. An interesting fact about the departmental funding guidelines for 2009/2010 and 2010/2011 is that they did not allow funding for overseas travel or accommodation under a specific guideline heading “What is NOT Funded” … overseas airfares and accommodation were a one line item under this heading. Then in 2011/2012 this one line item was conspicuously missing … the year that Mark Arbib went to NY. I will also give evidence to the Tribunal on Monday that Deek has publicly accused me of being “destructive” and “bringing the Project into disrepute” … all because I lodged a claim with Tribunal that he reneged on a handshake agreement. I am waiting to see now if he will try to get anyone in Alice to give evidence against me. I have not asked any Aboriginal person in Alice Springs to give evidence on my behalf. I did not want to embroil Alice Springs people, who are dear to my heart, in these issues. Because of racial sensitivities and longtime friendships in a dispute that is essentially between two white men who live in Canberra. However, four Alice Springs people from the wider community are giving written statements on my behalf. One Aboriginal person from FNQ, the uncle of Catherine Freeman, has also provided written statement of evidence on my behalf. Other Aboriginal people around Australia have offered. Thank you for publishing this letter. It is very stressful and I have not been feeling well for a long time. I will keep you informed of the Tribunal outcome.